March 2013 – Succeed.Net has completed a purchase of a 40 office executive suites across the parking lot from the amazing outdoor lifestyle mall “The Fountains” in fast growing Roseville, CA which is just south of the hugely popular Galleria Mall. This is located at 970 Reserve Drive, Suite 100 (half of bottom floor) in a high end 55,000 sq ft Class A commercial building. Succeed.Net plans to install gigabit speed fiber internet, and expand our Fixed Wireless Internet services to the Roseville Area and support local entrepreneurs and professionals succeed in their business goals with technology solutions. We plan to expand our offices and place new IT engineers and staff at this location. We plan to rent out the other suites as small office space to tenants such as start up companies, national company satellite offices, graphic artists, web designers, lawyers, marketing, financial planners, insurance companies, engineers, and more. For one low monthly fee we will be offering full service executive suite with the following included: Shared Receptionist, office furniture, common lobby and bathrooms, copy room, weekly janitorial, utilities, trash, WIFI and 1Gbps symmetric fiber optic based internet! Be part of an organization that wants you to Succeed in business! 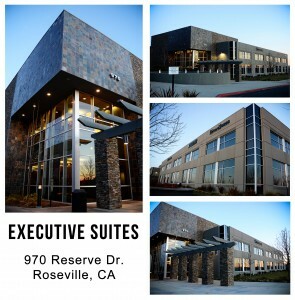 Check out our latest Succeed Professional Suites in Roseville, CA. Roseville is a fast growing high income area in Northern California just north of Sacramento.